I got the Chana Dal from the Indian store to make Coconut Chutney, and it has ever since been lying in my pantry just like that, because I have never got a nice feeling for the Chana Dal.. lol. Neither had I been a fan, nor I fancied the idea of eating chana daal. But yesterday what happened was I had run out of options on cooking, and so I decided to probably try this. I remembered my mom's recipe and so I set off. I was praying I could eat it as I was in no mood to prepare another dish. When I saw the final product, I was like; hmm.. looks good; and when I tasted it, I was overjoyed because it tasted wonderful for a hungry stomach and I finished it off quickly. 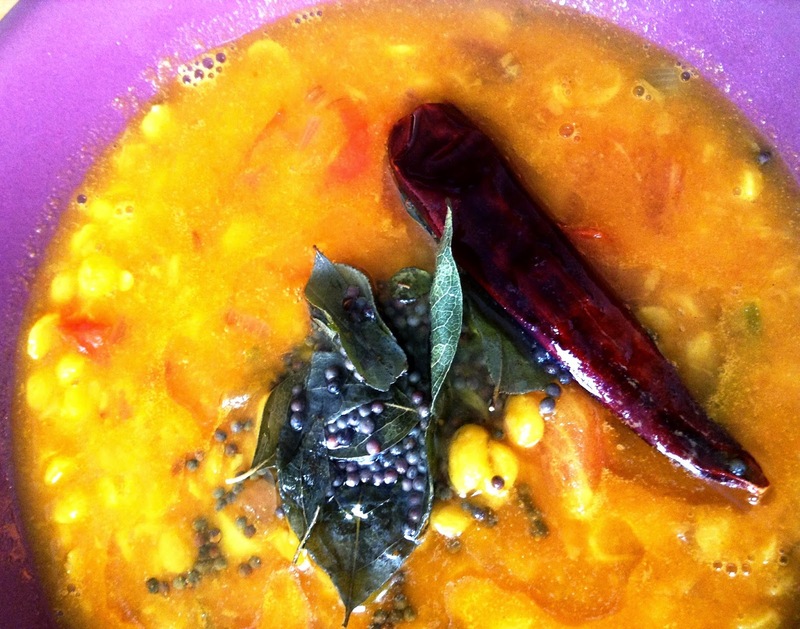 Here's my version of simple Chana daal..
Wash and soak chana dal in warm water for about 30 minutes. Pressure cook with salt and turmeric for 7-8 whistles. Heat oil in a pan and add cumin seeds. Add the onions and saute until they are transparent. Add the tomatoes, green chili and ginger. Mix well and let cook until the tomatoes are soft and mushy. Add salt, red chili powder and turmeric. Mix well and cook for another minute. Add all this masala to the boiled dal. Mix well and cook on medium flame for about 10 minutes. Prepare the tempering: heat oil in a pan and ad mustard seeds. When they splutter, add curry leaves and red chili. Let cook for about 30-45 seconds. Pour directly over the dal. Add lemon juice and serve. Loved this recipe? Please do leave a comment/feedback in the comments section below. Don't forget to connect with me on FACEBOOK for regular yummy updates!